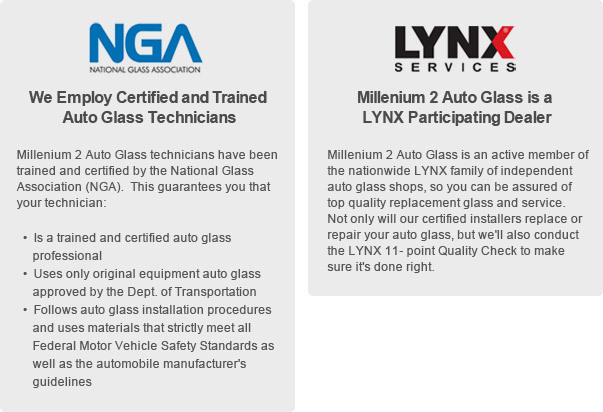 Millenium 2 Auto Glass was originally founded in 1957 as Morrell Auto Glass by William Malinowski, Sr., who had been in the auto glass and upholstery industry since 1951. Decades later, the company is still run by the Malinowski family. Millenium 2 Auto Glass has consistently been the primary choice of consumers, insurance agencies, auto dealerships, body and fender shops, commercial fleets and anyone else in need of auto glass and upholstery work for their cars and trucks. Millenium 2 Auto Glass is committed to your complete satisfaction! Our goal is 100% customer satisfaction. If you are not completely satisfied with your experience at Millenium 2 Auto Glass, let us know - we will make it right.